Granby volunteer firefighters from left to right Josh Anderson, Joe Russ, middle, and Chris Moore, right, train with fire hoses outside the fire station Nov. 21 in Granby. 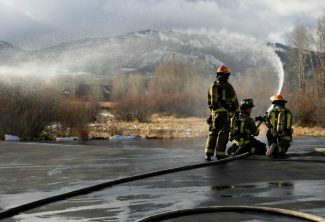 Small fire departments across the state are bracing for property tax cuts triggered by hot home values along the Front Range. The Granby Volunteer Fire Department (est. 1939) is staffed by volunteer and resident firefighters responding out of two stations and operating twelve apparatus. The department services 150 square miles and responds to between 170 to 190 calls a year all with a budget of less than $600,000 a year.